The Musgum or Moupoui are an ethnic group in Cameroon and Chad. They speak Musgu, a Chadic language, which had 61,500 speakers in Cameroon in 1982 and 24,408 speakers in Chad in 1993. The Musgum call themselves Mulwi. In Cameroon, the Musgum live in the Maga sub-division, Mayo-Danay division, Far North Province. In Chad, they live in Bongor Subprefecture, Mayo-Kebbi Prefecture, and in N'Djaména Subprefecture, Chari-Baguirmi Prefecture. This territory lies between the Chari and Logone rivers. Increasing numbers of Musgum in Cameroon are settling farther north, in the direction of Kousséri. 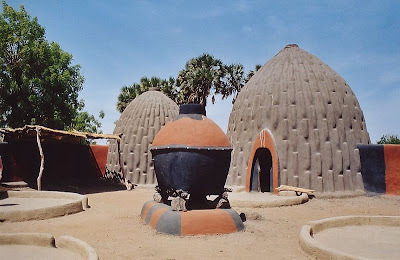 The Musgum are Neo-Sudanese in origin, having displaced the Paleo-Sudanese at the present territory along with other Neo-Sudanese.Their recorded history begins with their conquest by the Fulani during the jihad of Modibo Adama in the 19th century. Many Musgum have since adopted elements of Fulani dress and culture and have converted to Islam. Fishing is an important activity for the Musgum during the rainy season when the Logone River floods. This has led to ethnic tensions with rival fishermen of the Kotoko ethnic group.